Orthodox youth are being introduced to the work of missions through a ministry called Orthodox Youth Mission Team (OYMT). This program takes Orthodox youth from around the country to participate in a service project in Appalachia which then prepares them for service on an OCMC Mission Team. If you are a high school or college student looking to participate in a mission service trip in the Orthodox Church, the Orthodox Youth Mission Team (OYMT) welcomes you! Nine years ago, a small group of parents, recognizing that no such opportunity existed for their teens, enlisted the help of Fr. Luke Mihaly, pastor of Holy Trinity parish in Danbury, CT, and long-time OCMC board member, to help form OYMT. OYMT is open to faithful youth and adults across all jurisdictions. Its goal is to give young people the opportunity to put their Faith to work. OYMT brings youth and adults together to encounter Christ and deepen their personal relationship with Him through mission and service. During a week-long summer mission trip, team members serve in a cross-cultural setting working, worshipping, and living in community with fellow Orthodox Christians. OYMT has participated in several trips through the Appalachian Service Project (ASP). ASP’s goal is to help impoverished people in Appalachia make their homes “warmer, safer, and drier.” Crews, consisting of 2 adults and 5 teens, are paired with a family for a week of relational ministry and home repair. ASP vets the work projects and provides supplies, living quarters, and construction guidance. Adhering to the tenet of “meeting people where they are,” ASP’s philosophy is in harmony with the beautiful model of Orthodox mission as witnessed by missionaries like St. Innocent of Alaska and St. Nicholas of Japan. Two years ago, OYMT approached OCMC about the possibility of the youth mission team being sent out on a short-term OCMC trip. 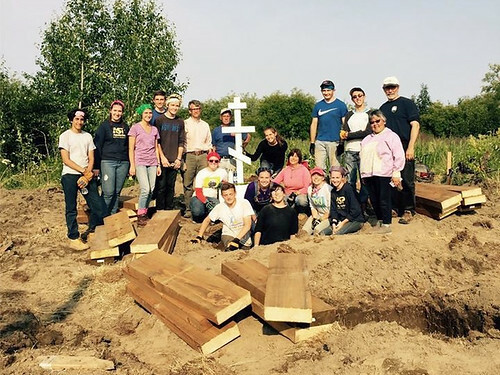 The work with ASP laid a good foundation, and OYMT had a fruitful experience in Napaskiak, AK, where they had the joy of serving and making friends in the community under Fr. Vasily Fisher. The team assisted with the running of youth and teen camps and also helped the village across the river, Oscarville, begin building a new church. OYMT provides an excellent training ground for people, especially youth, to experience and learn about relational mission ministry. It’s also a chance to introduce them to the work and vision that is OCMC. To date, several OYMT team members have expressed interest in exploring the possibility of short and long-term mission work through OCMC. OYMT also ignites a fire for missions in our Orthodox parishes. Because it involves high school youth, it also necessarily involves their parents, extended families, and parishes. OYMT has become a vehicle for sharing the work and enthusiasm for missions and the necessity of relational interaction to many Orthodox parish communities. Plans are underway for 2019 to again have an all-Orthodox center with ASP. The trip will take place from July 6-14, and OYMT is currently recruiting individuals and parishes who would like to be a part of this mission/service project. On Nov. 15 and 16, a training session is taking place at OCMC in St. Augustine for adults who wish to learn how to lead a team from their parish.